Happy 20th Birthday, Metro Rail! In between 1963 and July 1990, there was no mass transit that traveled by rail in Los Angeles County. I do not think it’s a coincidence that it was during this time that L.A. County — and, by extension, the rest of Southern California — cemented its reputation as the car capital of the free world, a place that became synonymous with gridlock and smog and a paradise paved several times over. Then, 20 years ago today, the Blue Line light rail opened between Los Angeles and Long Beach. I don’t mean to suggest that the old stereotypes vanished day — they didn’t and they shouldn’t yet. But I do think the tide began to turn that July 14 and I think the above video –made by the Los Angeles County Transportation Commission — reflects that view (it’s also a little heavy on the propaganda). 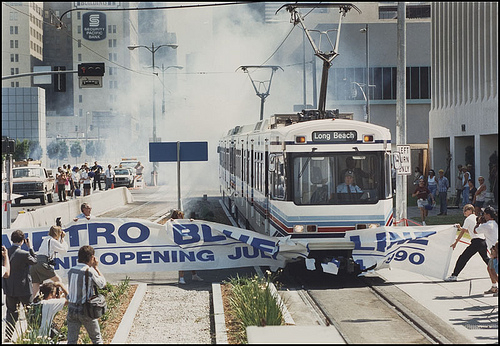 Opening day for the Blue Line, July 14, 1990. Metro today runs 79 miles of rail mass transit on four different lines in Los Angeles County. There are about 300,000 boardings each weekday on Metro rail, of which more than 70,000 are on the Blue Line — making it one of the busiest light rail lines in the United States. And since 1990, there have been more than 1 billion boardings on Metro Rail. The agency also makes a sizable financial contribution to Metrolink, the regional commuter railroad that began service in 1992. Metro rail is also quietly changing the landscape. Encouraged by changes in zoning laws, rail stations in some parts of town have become magnets for residential and commercial development. Downtown Los Angeles, Koreatown, Hollywood, North Hollywood and Long Beach each look remarkably different than they did prior to rail coming to town. 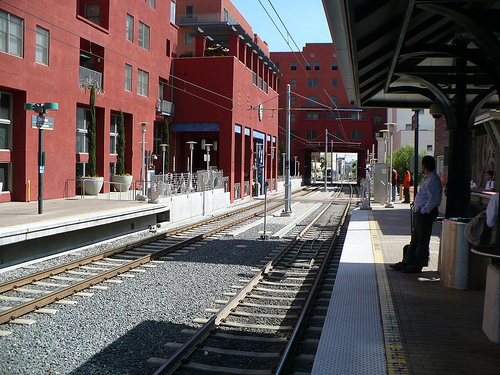 The Del Mar Gold Line station is literally surrounded by a transit-oriented development. Photo by Transit News, via Flickr. Click above to see the photo on Flickr. Metro’s 79 miles of rail exist because voters in Los Angeles County — after years of both the public and their politicians saying ‘no’ — said ‘yes’ to half-cent sales tax increases in 1980, 1990 and 2008, when a 68% super-majority of voters approved Measure R. All three sales taxes were designed and sold to the public, in part, as a way to expand the rail system. Before I write more, I urge you to spend some time today perusing recent posts on Primary Resources, the blog of Metro’s Dorothy Peyton Gray Transportation Library and Archive. This post looks at earlier rail connections between Long Beach and Los Angeles and this post documents the Blue Line’s opening day. Both posts, I think, convey that the return of rail to L.A. County was a big, big deal. As anyone who has followed transportation policy knows, the idea of whether rail is appropriate for sprawling Southern California has been debated for decades — and is still argued in some circles. Critics often say rail is too expensive, takes too long to build and doesn’t travel near enough homes or workplaces to be useful to many commuters. The last streetcar line in L.A. County closed in 1963. In the decades prior and in the years after, a variety of plans for rail systems (or monorails) were considered by area leaders; at one point a groundbreaking was held for a Wilshire Boulevard subway that was never built. The problem, in brief, was that political consensus couldn’t be reached on what to build, nor did voters — who had a new freeway system to enjoy — apparently see much value in building anything that couldn’t accommodate their automobiles. That changed in 1980, when the first of the sales tax increases was approved. The previous decade had brought an oil crisis, a growing environmental movement, new anti-pollution laws and more and more vehicular traffic as the region continued to sprawl. Whatever luster the freeway system once had was pretty much gone. •Rail in most cases provides a faster, smoother and more comfortable ride than buses. And it carries more people; a single subway train in L.A. can carry up to 1,000 people while light rail trains can each carry 600 to 700 passengers. Most buses max out at about 70. A single freeway lane can carry 2,000 vehicles per hour, although those vehicles will be barely moving. Trains — running frequently — can carry many times that amount and do it in a more fuel-efficient manner that also creates fewer greenhouse gases than the bloke driving alone. •Yes, busways and bus lanes — because they are cheaper to build than rail — will almost certainly play a big role in the transit future of So Cal and many other areas, including New York City. But the fact is that for now on many roads, it remains politically difficult to remove a lane of traffic for any reason. There are also traffic impacts that can be difficult to mitigate. •Most significant major cities in the world use a combination of rail and buses to move people around. By significiant, I mean cities such as New York, Chicago, Washington, London, Paris, Rome, Stockholm, Geneva, Munich, Berlin, Brussels, Barcelona, Madrid, Tokyo, Moscow, Hong Kong, Shanghai and San Francisco. Among many others. Rail isn’t perfect. On the Blue Line, there is no whitewashing the fact that enforcing traffic and pedestrian safety laws has been difficult (here’s the first of a series of posts we did on Blue Line safety). Rail remains ghastly expensive to build, especially when tunneling is involved. All of the rail lines that Metro has in the planning stages are expected to cost more than a billion dollars. Each. And rail is not always built in a perfect manner. I think it’s fair to question the wisdom of putting the Green Line down the middle of the 105 freeway and the Gold Line in the middle of the 210 freeway in Pasadena. Yes, both lines are fast a result, but the freeway segments are somewhat disconnected from the areas they are intended to serve. I think it’s a pity that there is no direct subway connection to Metrolink in the San Fernando and that a bus shuttle is needed to connect Norwalk’s Green Line and Metrolink stations. But I think it’s worth repeating: the system is only 20 years old. That’s barely adulthood on a human scale and I think it’s fair to say there’s considerable room for growth and maturity on Metro’s rail lines. Over the next 20 years, there will be extensions of current lines, new ones altogether and, in all likelihood, better transit, pedestrian and cycling connections between rail and surrounding neighborhoods. There almost certainly will be more development around the stations. And, yes, there probably still will be traffic — but there will a much better alternative to sitting in it. Over the next few days, we’re going to take a look at some history involving rail, what is ahead for Metro’s rail system and some of the people who are already getting around using rail and other mass transit. As is always the case, please provide feedback at sourcemetro@gmail.com.